Oriol Sans describes how he has experienced and how he experiences his intolerance. A work which combines personal narration with all of the information and advances that he has gathered on this topic throughout his life. 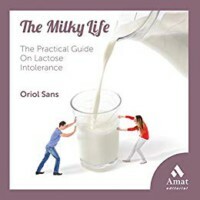 A book that will help you to understand your lactose intolerance in a practical way from a medical and dietetic, but mostly personal, perspective. The essential guide for all who are lactose-intolerant. It includes 100 questions and answers about lactose intolerance. You can find it in the following bookshops and online stores in both paper and e-book format.